It's been a few years now since I was a classroom teacher, after Ethan was born I decided not to go back to work when my maternity leave finished and to stay home with him instead. I have kept up with some of the changes to the curriculum in schools, but somehow the Year 1 Phonics Screening Check completely slipped by me, so I was very surprised when I found out about it at the beginning of the school year information meeting with Ethan's teacher. Basically at the end of year one all of the Year One children across the country will be tested on reading a set of 40 words, including real words as well as non-words. These non-words are referred to as alien words and are made up of a combination of phonics sounds, blends, digraphs and trigraphs. 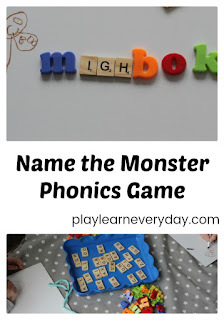 We decided to have a little fun and make up our own non words to name some monsters in a really simple game to help prepare Ethan for the screening check and generally work on his phonetic reading skills. The game couldn't be easier to play, the only thing that I wanted to prepare in advance was the digraphs and trigraphs. 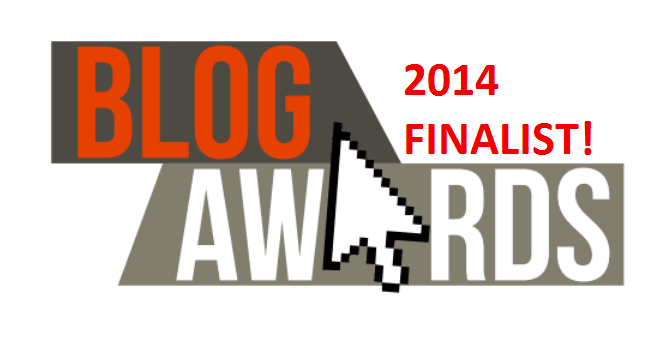 There are a few that Ethan doesn't always recognise in words, so this will be a great way to go over them. I made as many digraphs as I could with the assorted Scrabble tiles that I had, using washi tape to stick them together at the back. These are all digraphs and trigraphs that the children should be able to read by the end of Year One. I set up the play space and the children were ready to start! I gave each of them a white board, then put all of the individual letter sounds, digraphs, white board pens and eraser in the middle to share. The children each drew their own monster to begin. Next they can either swap white boards and name the other person's monster, or keep their own to name. Both Ethan and Ivy quite liked their monsters so they kept their own to name. They did this by just choosing a variety of individual sounds and digraphs to make the name. Ivy doesn't know how to read yet, but this game is so simple that she could still play. 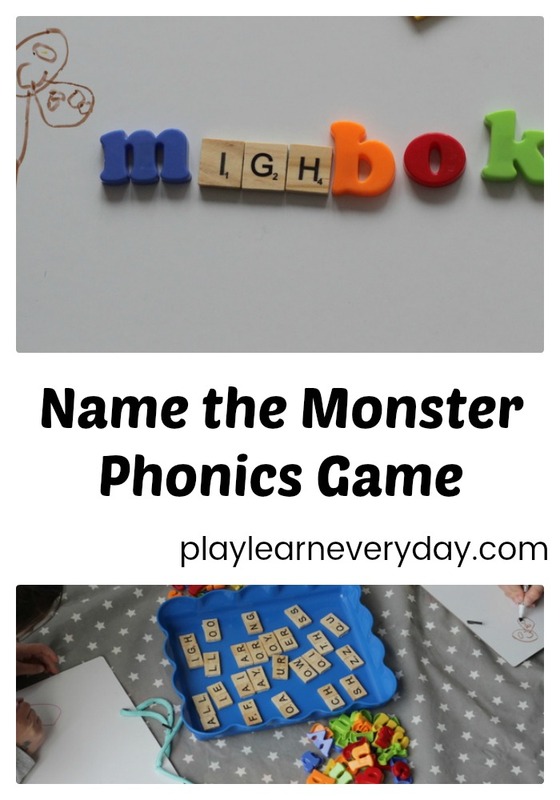 She chose some letters and put them together to name her monster, then I helped her to identify each sound and blend them together to read the monster's name. Once Ethan had named his monster he then had to read it out to me. 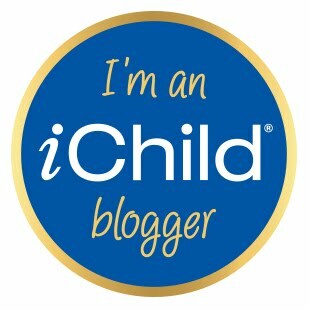 We have no rules in this game and give the children complete freedom in in the names that they want to create. As Ethan became more confident he was happy to experiment with combinations of digraphs that he wouldn't normally put together, to see how they would sound. 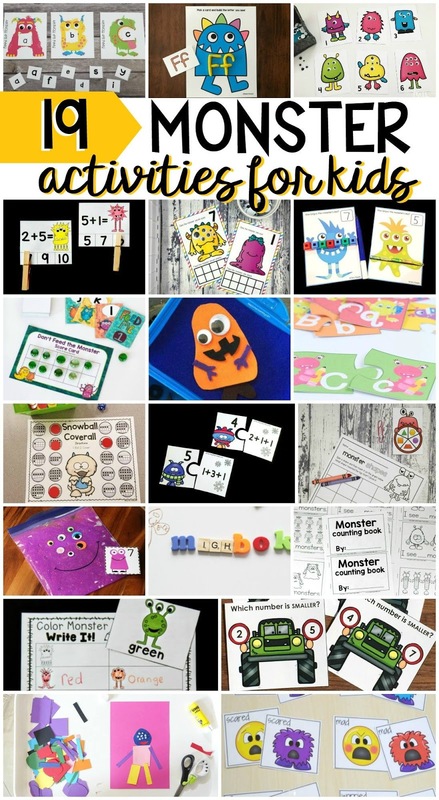 It is incredible how such a simple activity can increase confidence and comfort levels with these made up non words. If the children understand how easy it is to make these words and have the opportunity to experiment in a non pressured environment then it will definitely help them to feel more comfortable with the screening check. 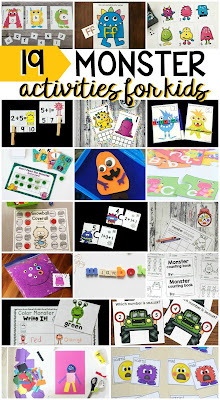 This post is part of a kids' activities blog hop of monster themed ideas, check them all out!